Construction drawings, or blueprints, are utilized in conjunction with construction specifications to build buildings and other manmade structures. 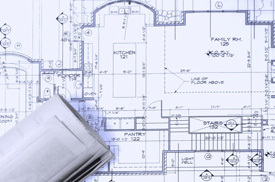 Here at Draftermax, we create construction drawings from scratch to meet your specifications. From assembly details to sections, floor plans to elevations, we can craft scaled construction drawings that fulfill your desires and demands. Assembly detail drawings are utilized for particularly intricate assemblies. These close-up drawings provide a scaled view of construction details, and often include specifications for assembly. An assembly detail might include a drawing of the assemblies of a foundation, flooring, and wall, as well as dimensions and/or information surrounding assembly of those structures. Another assembly detail might display how metal joints are utilized to join floor joists. Assembly detail drawings are effective for communicating instruction steps for more complex assemblies throughout a structure. 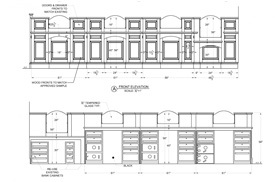 A section drawing displays a “sliced” view of the building. Sections are an ideal medium for displaying wall assemblies, roof assemblies, flooring assemblies, and foundations. Sections often display the material composition of the aforementioned assemblies, and they may include dimensional information or assembly specifications. Assembly detail drawing can be combined with section drawings to give further detail to more complex areas of a section. Floor plans display a bird’s-eye view of the layout of a building. Like a section drawing, a floor plan shows a “sliced” view of the building, but the drawing provides a vertical view of a building, instead of a horizontal view. Floor plans are scaled drawings that usually include dimensional information and information about the program (or use) of individual rooms and spaces throughout the structure. For instance, a floor plan may designate that a home has a family room, a master bedroom, a master bathroom, a dining nook, a laundry room, and a 2-car garage. 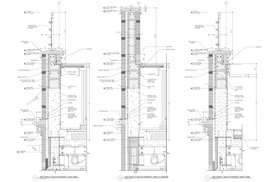 Elevation drawings are similar to section drawings, because they display a scaled view of a home or structure. Elevations, however, do not show a “sliced” view of the building. Instead, elevations display an exterior view of the structure. Elevations often include information surrounding the materials of a structure and dimensions of that structure, and they may include information about the landscape surrounding the structure (existing trees, planned landscaping, changes in ground grading, etc.). Here at Draftermax, we provide more than just drafting. We’ve worked alongside architects, designers, realtors, building managers, and developers. Plus, we bring over eight years of experience to the table. We work with clients from overall design to detailed construction drawings to filing plans. That means that we can work with you for every process along the way, or any process throughout the design and construction of your home or building. We have the resources and experience necessary to make design a fluid, simple process for our clients. Count on us for CAD drawings, 3D computer renderings, and 3D modeling services. If you’re curious about any of our architectural design services, don’t hesitate to get in touch with us! We’re here to connect you with the right design, and ultimately, the home of your dreams and the structure you demand.